Guys, it's April tomorrow, and I drove to work through snow yesterday. SNOW. Why is this still happening?! Could someone come get me out from under my comforter when it's all over? Speaking of work, this was a particularly busy month for me. I visited a couple of schools for data collection (at one of them, I got a big ol' sneeze to the face first thing in the morning—gotta love 6-year-olds), finalized a short list of summer interns for interviewing, and I went to an academic conference in Philadelphia to present some of my lab's research. I even got to walk around and see historic sights! And pet less historic kitties! About the only thing I didn't do much of in Pennsylvania is reading, though The Storied Life of A.J. Fikry did make for an excellent travel book. More on that to come. Aaaand speaking of books, I only read five in March, falling woefully short of the eight-book bar I set in January and February. But, y'know what, whatevs. I've got two reviews up so far and hope to get the other three written soon. On the bright side, I did get a third review posted—I wrote about The Good Earth, which I only read in *cough* January *cough*. I posted a couple of non-review pieces that I'm particularly proud of this month. In case you missed it, I wrote about the treacherous impostor syndrome and how to overcome it, and I shared my thoughts on (and a few questions about) a thought-provoking interpretation of the classic Cinderella story. OK, so this one is vaguely Shaina-related. Have you guys heard of Oh, The Books!? They're a pair of YA bloggers (an evil mastermind and a crazy cat lady, to be exact), and they put together the most ridiculously comprehensive weekly recaps I've ever seen. Check - your post is probably on there! They've featured me twice, and I've had a lot of fun poking around their site. Trish of Love, Laughter and a Touch of Insanity hosted her very first Day in the Life feature. She asked bloggers to devote a post to their daily routine, and they came out in spades - more than 60 people shared a slice of their lives! It was a lot of fun to sneak a peek into the days of the people behind the blogs, and I really hope to participate next time. Congrats on such a successful event, Trish! Have y'all ever wanted a place you can go to seriously talk about that last book you read without worrying you'll spoil it for someone else? The Socratic Salon might just be for you. It's a brand new blog, but the five women who run it have kicked it off to an amazing start with an in-depth discussion of Hausfrau. If spoilers don't scare you, check it out! Dewey's 24-Hour Read-a-thon. 24 straight hours of reading. I wouldn't be a blogger if not for Dewey's. 'Nuff. Said. DO IT. April of The Steadfast Reader and Katie of Bookish Tendencies are hosting a month-long Cloud Atlas read-along. I've never read anything of Mitchell's, so why not dive in with some friends? 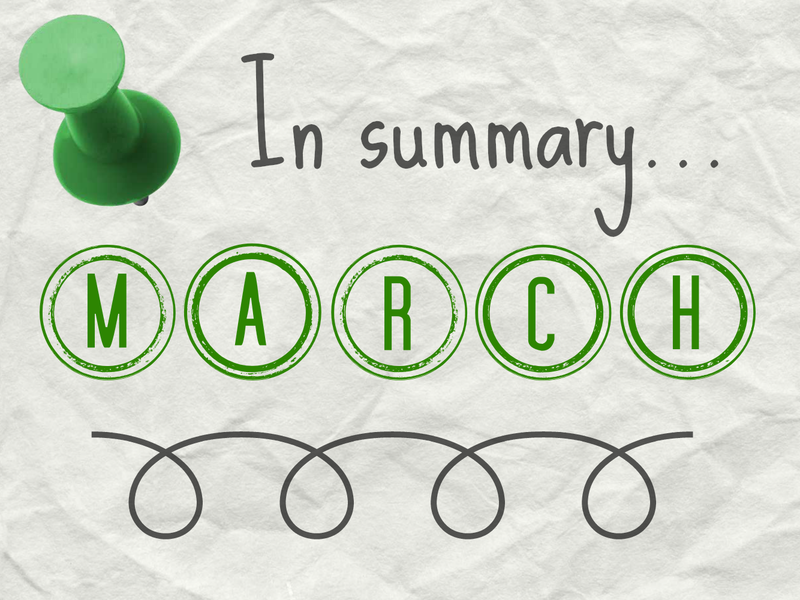 How was your March? Anything exciting coming up in April? Tell me all about it! <3 you make my heart sing. I did like it! I think I'm in-between Andi's "meh" and a few other bloggers' glowing receptions. It was a really solid book! Are you going to pick it up soon? I really enjoyed your post about imposter syndrome! I've also been enjoying the Hausfrau discussion in The Socratic Salon; I'm so glad that community exists. I also read both Hausfrau & A.J. Fikry this month! So excited you'll be reading Cloud Atlas with us! I hear this is a good place to start with Mitchell, so I think you'll be fine having never read any of his other works. Can't wait to get chatty all month long! No matter the number of books, your March sounds like it was fantastic!! Really enjoy your input over at The Socratic Salon! Snow in April does sound crazy. I hope spring comes your way soon. It sounds like work has been keeping you very busy. I am glad you were able to get some reading in, even if not as much as you'd hoped. March was not a good reading month for me number wise either. I loved your Cinderella post. And your post about the Imposter Syndrome, which I can relate to more than I want to admit. I hope you have a great month of April! I loved AJ Fikry - was my favorite book of 2014! And, loved the Hausfrau discussion on Socratic Salon even though I didn't love the book itself. I LOVE Oh, The Books! Weekly Recaps! I look forward to when they're in my inbox and I can put some time aside to peruse all the great articles. That's the one issue I'm running into—not enough time to sift through all the fantastic posts they find! I'm really amazed by what a great curating job they do. Ooh, how did you feel about it? I think I was in between the "meh" some people experienced and the glowing feelings others expressed. I found it to be an extremely solid book, but I still need to mull over exactly what I think about it. Work has been super busy! It's only going to get busier, what with a lot of school visits and summer interns arriving in June... in a way, this is very welcome, as January and February were unbearably slow. I like keeping busy at work! I think that's how a lot of us feel when it comes to impostor syndrome. :/ Hopefully we can keep combating it together. Aw, thank you so much! I'm glad so many people got something out of it. Isn't TSS fantastic?! I hadn't realized how much something like that was missing in the blogging community until it appeared. I can't wait to get caught up on their reading list and join the fray once again. You were such a busy bee in March! (Sorry about the sneeze to the face. Bet you woke up quickly after that one.) Waiting to hear what you thought of A.J. Fikry. It's on my list, but I've been putting it off. You read Blade Runner? Is it any good? I do love the movie (mostly because Harrison Ford), but in my ignorance I didn't even know it was a book. That's happened a lot to me lately. And I hope you get a moment to check out my A.J. post! I quite liked it, partially because of the circumstances under which I read it. It was good! Shamefully, I don't REALLY remember the movie. I've been meaning to watch it again since reading (and, also, review the book... always more reviewing to do... sigh). Haha, agree to disagree on #1!